This fascinating, heartfelt documentary focuses on Stanley Pleskun, a.k.a. Stanless Steel, a middle-aged man from South Brunswick, New Jersey who strives to become the strongest man in the world. He can bend a penny using his fingers, briefly lift up a 10,000-pound truck and can even hammer nail into a thick board with just his hands. Stanley spends a lot of time practicing his amazing skills at home and strengthening his body while trying to maintain a healthy diet of unprocessed food. Ironically, though, he smokes cigarettes and drinks a lot of booze which is farfrom a step in the right direct in terms of good health. His loving and supportive girlfriend, Barbara, and her sister both live together with him. Director Zachary Levy does an impeccable job of providing unflinchingly candid footage his subject matter by avoiding the use of interviews and voice-over narration. Talking heads would have ruined the film’s momentum, so Levy is wise for merely documentary Stanley’s day-to-day travails. It’s interesting to observe how Stanley persistently tries to get gigs so as to become a financial success rather than struggling with his income. As one of his good friends tells him up front, he needs to learn how to market himself to an appropriate audience instead of showing off his talents in front of a concert crowd. When he travels all the way to London for a TV show gig, he discovers the harsh truth that another other entertainer on the show receives more money for the gig than he does. 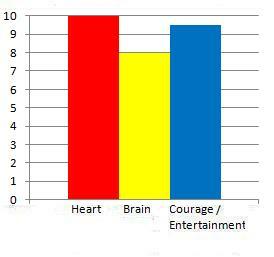 Stanley comes across as a hard worker who has some regrets, anger and insecurity bottled up inside him. Levy includes some dryly humorous moments for levity, i.e. when a group of teens gather around him at a convenience store and, when they ask him if he’s getting paid millions of dollars for being in the movie, he lies, “Yes.” Or, in another scene, a friend tells Stanley that if he continues to walk around with braided hair bangs, he’ll end up cast in a movie as a Native American. Running parallel to Stanley’s struggles, there’s the evolving dynamics between him and Barbara which won’t be revealed here, but it’s worth mentioning that Levy documents a scene early in the film where, unbeknownst to Stanley, Barbara’s face looks frustrated, sad and worried about something. Sociopsychologist Erving Goffman once wrote that everyone has a separate life backstage and front stage. Levy so captures Stanley’s life backstage effectively that it’ll be clear to you that he successfully managed to earn Stanley’s total trust and openness in front of the camera, a task that’s not always easy to achieve. 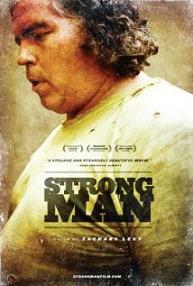 At a running time of 1 hour and 53 minutes, Strongman is thoroughly fascinating, heartfelt and unflinchingly candid. Number of times I checked my watch: 1Released by No Props, Inc. Opens at the IFC Center.